Free Shipping Included! 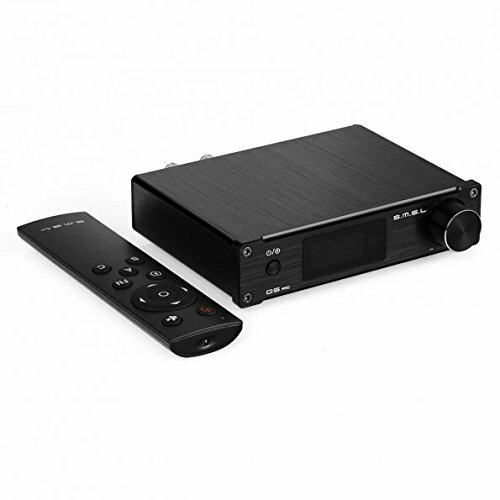 SMSL Q5 Pro Digital Amplifier 2 - 50W USB/Coaxial/Optical with Remote Control - Black by SMSL at The Met Theatre. MPN: Q5 Pro(black). Hurry! Limited time offer. Offer valid only while supplies last. This Q5 Pro 2x50w digital power amplifier can be used for multi-function equipment. It supports fiber optics, coaxial, analog and computer USB input. This Q5 Pro 2x50w digital power amplifier can be used for multi-function equipment. It supports fiber optics, coaxial, analog and computer USB input. Including the mainstream audio mode. Equipped with the function of remote control, easy for far distance control. We offer customers reasonable price, multiple and economic shipping modes, high-quality, professional and faithful after-sales service. Our aim is trying our best to satisfy our customers, so just hurry up to start shopping in our store, a wonderful shopping experience is waiting for you. Features: Equipped with high-quality remote control, easy to operate. LED digital tube display screen design, easy to read machine status. Remote control or key control function. Pure aluminum made, thorough CNC processing and drawing oxidation process. Computer USB decoding support 24bit, 44.1-96KHZ. Shutdown memory function (Volume not be memorized). Specifications: Model: SMSL-Q5 pro. Inputs: optical, coaxial, analog, computer USB. Outputs: 2 channels (stereo). Sampling rate: 44.1-192khz (coaxial optical fiber); 44.1-96khz (computer USB). Bit depth: 16-24bit. Frequency response: 20hz-22khz. Impedance adaptation: 4 to 8 ohms. Maximum output power: 50w/4ohm 35w/8ohms. Dynamic range: 102db. SNR: 81db. Power consumption: 102W (Max). Dimension: approx. 137x103x33mm (NOT including bulge). Weight: approx. 1kg. Colour: black/black with silver/black with gold available, please check in our store. 100% Brand new. NuForce STA200 160-watt Stereo Power-Amplifier, GOLMUND Swiss-design!